While farms are the leading source of pollution entering Chesapeake Bay, they are not the only source. 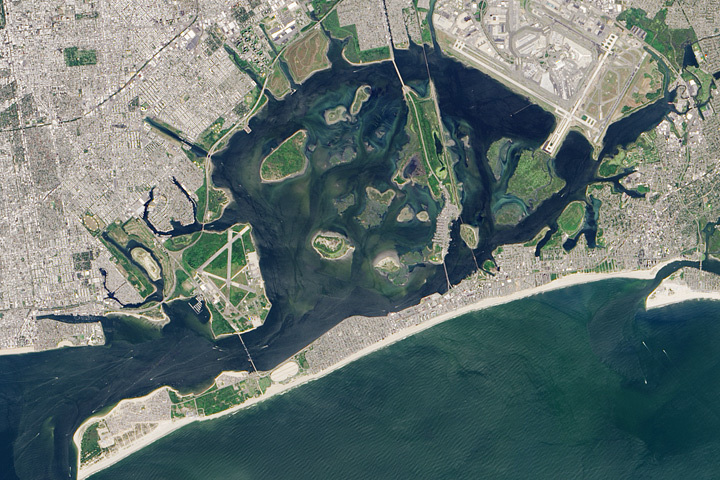 Urban and suburban areas contribute large quantities of nitrogen, phosphorous, and sediment—the three main pollutants that cloud Bay waters and cause algal blooms and dead zones. The pavement, asphalt, and other impervious surfaces found in cities act as both conduits and sources of pollution. Rather than being absorbed by soil or vegetation, rain that falls on roadways and other hard surfaces tends to flow rapidly toward gutters and urban streams. In the process, that water picks up nitrogen, phosphorous, and a range of oils, salts, heavy metals, pharmaceuticals, and other pollutants. The rapid flow also means that urban stream banks tend to erode rapidly and yield large amounts of sediment pollution. Meanwhile, power plants, factories, and motor vehicles continuously burn fossil fuels that fill the air with nitrogen and chemical contaminants. 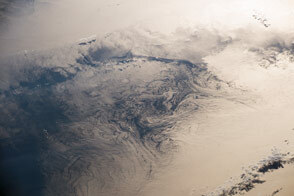 These pollutants enter the watershed when they fall back to Earth in the rain. City sewer systems regularly flush nitrogen and phosphorous-rich wastewater into rivers; septic systems deliver it, too, by way of groundwater. Even lawns, if improperly maintained, add to the Bay’s load of pollution. There is both good and bad news coming out of the cities and suburbs in the Chesapeake Bay watershed. On the positive side, the amount of pollution reaching the Bay through wastewater from sewage treatment plants is declining rapidly. However, the load of some pollutants arriving through stormwater runoff has risen. Since 1985, the wastewater sector has decreased the amount of nitrogen it releases into the Bay by 75 percent and phosphorous by 57 percent. In 1985, for instance, wastewater treatment facilities discharged 89 million pounds of nitrogen into the Bay. By 2015, it was just 38 million pounds. In other words, the wastewater sector went from being the source of about half of the nitrogen entering the Bay to one-sixth of it. Cuts like that mean wastewater managers are about a decade ahead of the pollution-reduction goals established by the Environmental Protection Agency. Such gains are especially notable because a major upgrade at the Back River Wastewater Treatment in Baltimore County is yet to go online. That upgrade will reduce the nitrogen pollution from that facility, the largest in Maryland, by at least 20 percent. 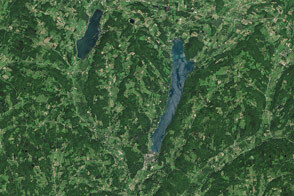 The image at the top of this page, captured by the Operational Land Imager (OLI) on Landsat 8, shows ongoing construction at the Back River plant. Notice the brown construction site located between rows of circular clarifiers—special tanks designed to separate out solid particles from wastewater. 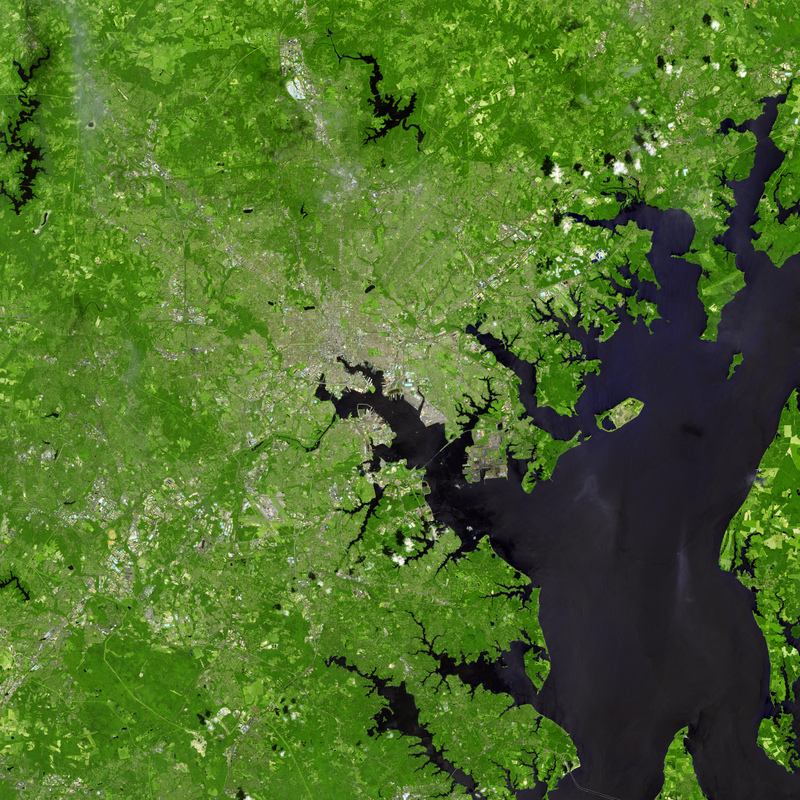 Other features in the image include the heavily developed areas near the center of Baltimore City (gray), suburban areas to the south and east of the city (light green), and the Patapsco River, the heavily polluted urban river that enters Baltimore Harbor as it flows into Chesapeake Bay. 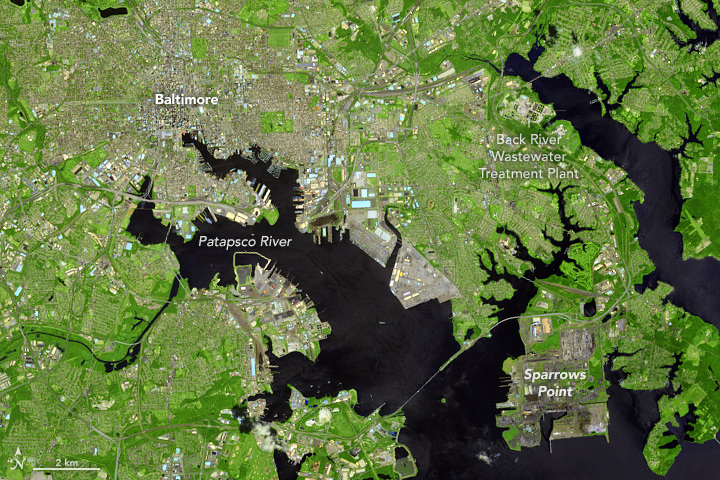 While the work at Back River means Baltimore’s environmental footprint may decline somewhat in the future, other features in the image highlight the inherent challenges that urban and suburban areas pose in cleaning up the Bay. Like many cities, Baltimore’s land is mostly covered by buildings, roads, parking lots, and sidewalks made of impervious materials. Meanwhile, green spaces like forests, wetlands, and parks—which can act as sponges for flood waters and pollutants—are rare. The problem of stormwater runoff is particularly acute and complex in Baltimore because of the city’s long history as an industrial center. Large industrial sites (some active, some abandoned) are common in parts of the city. 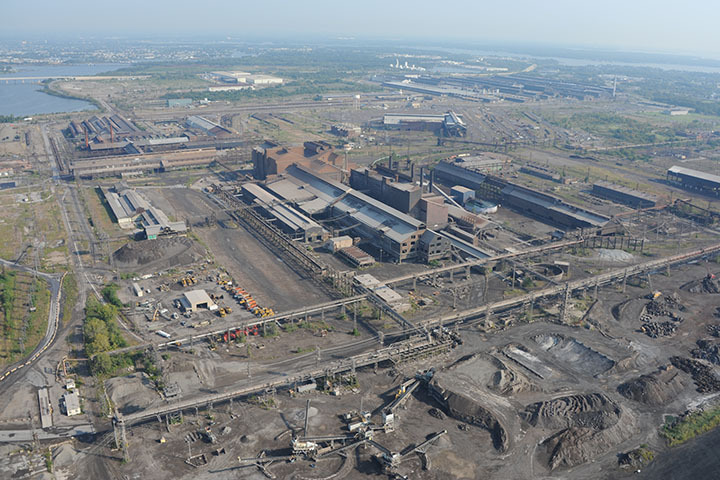 Sparrows Point (see photograph below), once a Bethlehem Steel factory, persists as one of the largest impervious surfaces in the city. Water quality tests show toxic chemical contaminants are commonly found near Sparrows Point, including polyaromatic hydrocarbons, benzene, chromium, and lead. According to the Chesapeake Bay Foundation, stormwater represents the fastest growing source of pollution across the watershed. In 1985, stormwater delivered about 34 million pounds of nitrogen into the Chesapeake. By 2015, it was 40 million pounds. In fact, stormwater runoff is the only source of Bay pollution that is rising. Modeling by the Chesapeake Bay Program—a unique regional partnership involving state and federal governments, academia, nonprofits, and the private sector—shows that pollution from agriculture, wastewater, air pollution, and erosion from forested areas have all declined since the Environmental Protection Agency, federal and state agencies, and non-governmental organizations launched a campaign to clean up the Chesapeake Bay in 1985. The maps above, based on Landsat data compiled by University of Maryland researchers, highlight the increase in impervious area in the Greater Baltimore Area. The map on the left shows impervious surfaces in 1984; the map on the right shows them in 2010. Note the widespread expansion both within the city center and the surrounding areas. While suburbs may seem like they would have little impact on water quality, turf grass lawns are only partially permeable, so they enhance stormwater runoff (compared to forested areas). And just as with farm crops, if lawns are over-fertilized they can contribute significant loads of nitrogen and phosphorus to waterways. “There is more turf grass than there is corn in the Chesapeake Bay watershed, so the way people treat their lawns can make a real difference,” said Claggett, who has developed techniques to monitor the extent of turf grass with Landsat. According to statistics compiled by the Chesapeake Stormwater Network and Claggett, more than 9.5 percent of the watershed is turf grass—about 3.8 million acres of land. Turf grass covers 35.9 percent of the land in Baltimore County. Only Fairfax County, Virginia (46.5 percent), Montgomery County, Maryland (44.2 percent), and Prince George's County, Maryland (39.4 percent) have higher percentages of turf grass. There are ways to counter stormwater runoff in cities and suburbs. The most effective approaches are to limit development of new impervious surfaces, preserve forested landscapes, enhance the permeability of urban soils, and expand green spaces in cities. Beyond that, the use of infiltration strips, sand filters, rain gardens, green roofs, and other infrastructure can help. 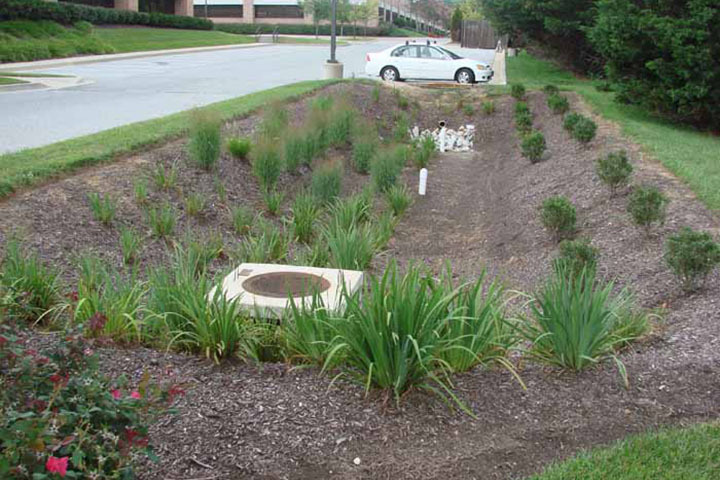 The photograph above shows bio-retention infrastructure in Hunt Valley, Maryland. This type of infrastructure helps slow the flow of stormwater and filters out some pollutants before they reach the Bay. Some 20,000 individual stormwater improvements are located throughout the Baltimore region, though surveying conducted by Community & Environmental Defense Services, an environmental consulting group, has shown that not all are maintained and fully functional. Given the expected population growth in the Chesapeake watershed, this means urban planners face a considerable and growing challenge. Editor’s Note: This is the third story in a multi-part series exploring the natural splendor and environmental issues of the Chesapeake Bay Watershed. Read part one and part two. 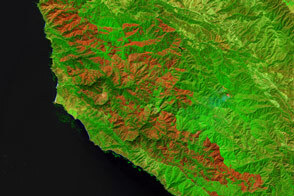 NASA Earth Observatory images by Joshua Stevens and Jesse Allen, based on Landsat data from the U.S. Geological Survey and a paper by Song et al. (2015). Sparrows Point photograph courtesy of The Center for Land Use Interpretation. Bioretention photograph courtesy of Community & Environmental Defense Services. Caption by Adam Voiland. While the amount of pollution that wastewater treatment plants contribute to the Bay is declining, the spread of asphalt, pavement, and other impervious surfaces in suburbs and cities is increasing stormwater pollution. Bay Journal (2016, July 11) Wastewater treatment plants meet Bay goals 10 years early. Accessed September 13, 2016. Chesapeake Bay Foundation (2016, August 3) Sparrows Point: Toxic Chemicals in Sediment Continue to Affect the Environment. Accessed September 13, 2016. Chesapeake Stormwater Network (2010) The Grass Crop of the Chesapeake Bay Watershed. Accessed September 13, 2016. Chesapeake Bay Program (2016) Stormwater Runoff. Accessed September 13, 2016. Chesapeake Bay Program (2016) Land Use Workgroup. Accessed September 13, 2016. Chesapeake Bay Program (2016, August 3) Photo Essay: Seen from above, humans and nature intertwine along the Chesapeake Bay. Accessed September 13, 2016. Claggett, P. et al. (2013, September 4) Estimating the Extent of Impervious Surfaces and Turf Grass across Large Regions. Journal of the American Water Resources Association. 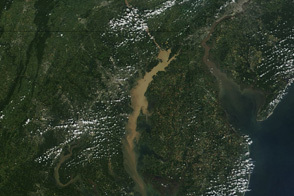 Earth Sky (2012, September 27) Peter Claggett sees changes to Chesapeake Bay with Landsat. Accessed September 13, 2016. Maryland Department of Planning (2013, September) Citizens Guide to Restoring the Bay. Accessed September 13, 2016. Song, X.P. (2016, March 15) Characterizing the magnitude, timing and duration of urban growth from time series of Landsat-based estimates of impervious cover. 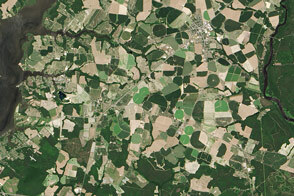 Remote Sensing of Environment, 175, 1-13. The Baltimore Sun (2015, October 31) Baltimore faces deadline to remove acres of pavement, reduce runoff . Accessed September 13, 2016. 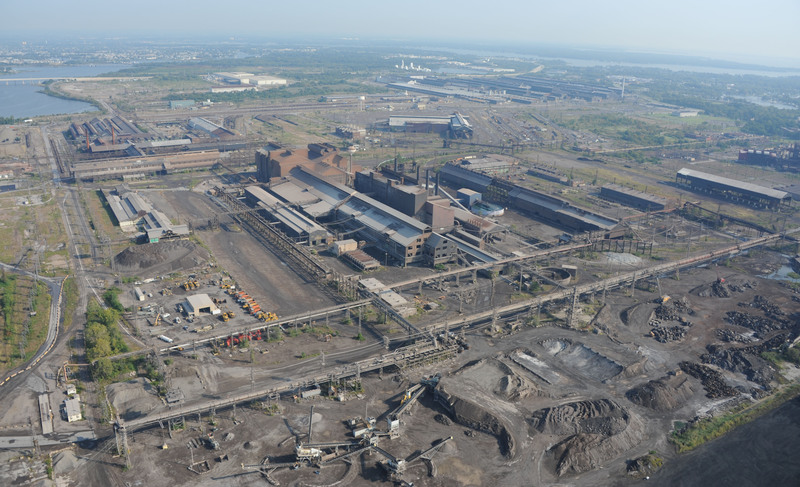 The Baltimore Sun (2015, October 31) Former steel mill has biggest stormwater bill in Balto. Co. Accessed September 13, 2016. U.S. Geological Survey (2007) Synthesis of U.S. Geological Survey Science for the Chesapeake Ecosystem and Implications for Environmental Management. U.S. Geological Survey Circular. Water & Wastes Digest (2016, September 10) Cleaning Up the Back River. Accessed September 13, 2016.